Continuing our 10 year Anniversary celebration, we are featuring French Producers for the month of September! 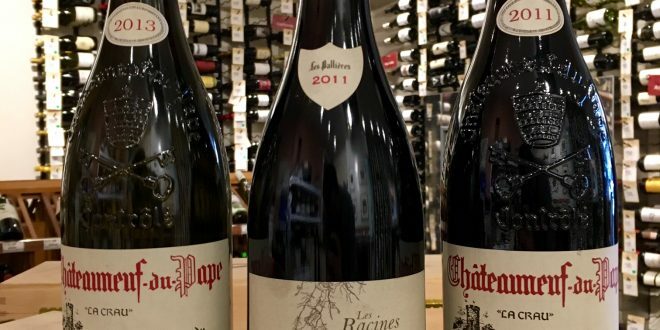 Friday’s tasting we are featuring one of the most revered families of Chateauneuf du Pape, the Brunier family. 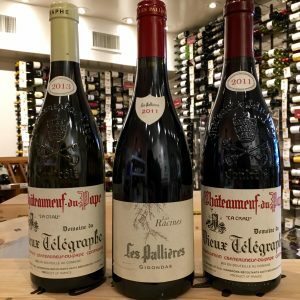 We will be pouring the Vieux Telegraphe Rouge 2012, Vieux Telegraphe Blanc 2013 and their side project Domaine Les Pallieres from Gigondas. Friday September 9th 2016 from 5pm to 8pm. We believe tasting wines side by side is always a great way to learn and appreciate the differences and similarities! Usually centered on a theme, our casual tastings run in-store every Thursday from 5pm-8pm. To sweeten the deal, we’ve discount all the wines being poured that day!